Are you one of those people who likes things a little bit different? Do you like cats, but have always wanted to own a piece of the wild? This article might be exactly what you’ve been looking for. Today, we’re going to look at things you may not have thought could ever be pets. A bit of warning: Please check your local laws before taking home any of these animals. Animal legislation tends to vary with location. For example, in the U.S., it is legal to have a Western hognose snake in most states, but not in my home state of Illinois because they’re a protected species. Ohio has some of the loosest animal laws, but Georgia is more strict. Hawaii, Australia, and every other island will ban everything except cats, dogs, and livestock, and even those are notoriously invasive. In the interest of time, I will not mention the red tape unless it is particularly noteworthy. I’m also not here to do all of your research for you. Before you decide that, for example, a fennec fox is your ideal pet, I recommend clicking around YouTube for fennec videos. 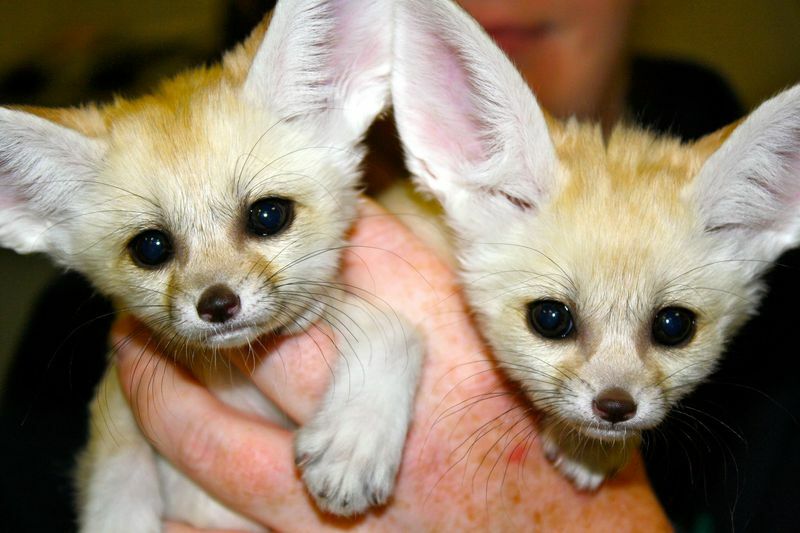 Fennecs are adorable, but also noisy, and have special requirements. While I can summarize some of these warnings, it’s really best to get more details before you commit. Some of these pets may live long enough to be in your will! 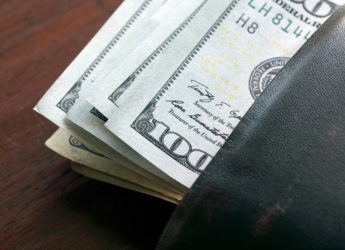 This piece exists mostly to get your gears turning. Most of you probably didn’t even know you could have these animals as companions! If a normal cat or dog simply isn’t for you, read on. The red fox (Vulpes vulpes) is one of very few “exotic” animals that has been successfully domesticated. Russian scientist Dmitry Konstantinovich Belyaev conducted an experiment under the idea that the wolf could have become the dog by selecting for docility alone. 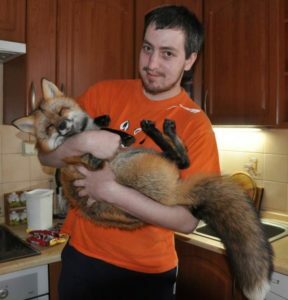 Only the foxes who were least afraid of humans were allowed to breed. No less than five years into the project, the foxes began wagging their tails and whimpering for human attention. As the experiment went on, their tails curled, ears creased, and coats began developing irregular white spots – almost unheard of in wild animals, but common in anything that has been domesticated. For all intents and purposes, these “Siberian foxes” are domesticated animals. They’re in the process of becoming pets in the grander scheme as well; both Russian institutes and a young lady in Michigan have continued what Belyaev started. Give them time. For those of you who want a fox right now, the fennec fox (Vulpes zerda) is a better bet. They are not only smaller (about as big as a Chihuahua) and cleaner than red foxes, but also have less legal issues. Their personalities can be anywhere between a cat and a ferret. Even though they haven’t been selected for docility like red foxes, I’m sure someone, somewhere is working on it – they’re too cute! Axolotl are of great interest to science. Along with never metamorphosing, axolotl have some of the craziest regenerative powers in the vertebrate world. They can regenerate tails, limbs, and even vital organs like the heart and brain. This has led to many axolotl being bred in captivity, and not just for science! 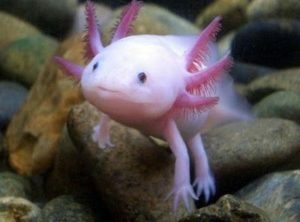 Bonus point: the lakes that wild axolotl live in are at risk, and surveys in 2013 yielded none in the wild, so having them in captivity is a safety net for the species. You thought the mad science stopped at cutting the hearts out of axolotl? Far from it! 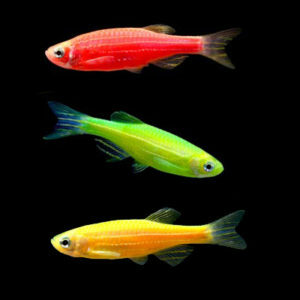 GloFish is the official trade name for any number of jellyfish-spliced fish, including zebra danios (Danio rerio – pictured) and tetras. There are even glowing axolotl! As the name might imply, GloFish glow in a rainbow of neon colors under blacklight. What’s the secret? A special gene called GFP (Green Fluorescent Protein) and its multicolored brethren. These are all derived from cnidarians (jellyfish, anemones, and so on) and spliced into whatever gene needs to be tracked. This is useful for tracking genetic diseases, among other things. In pets, it just looks really cool. Savannah cats are proof that cat owners have a few tricks up their sleeves that dog owners don’t. Many small wildcats, including servals (Leptailurus serval) and Asian leopard cats (Prionailurus bengalensis), are legal by state (again, check your local laws). It’s a little tricky, but they can also breed with the average house cat. 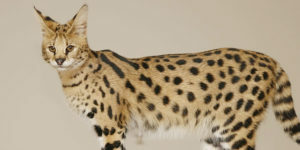 The resulting hybrids are large, exotic looking cats like the Savannah (domestic cat x serval). 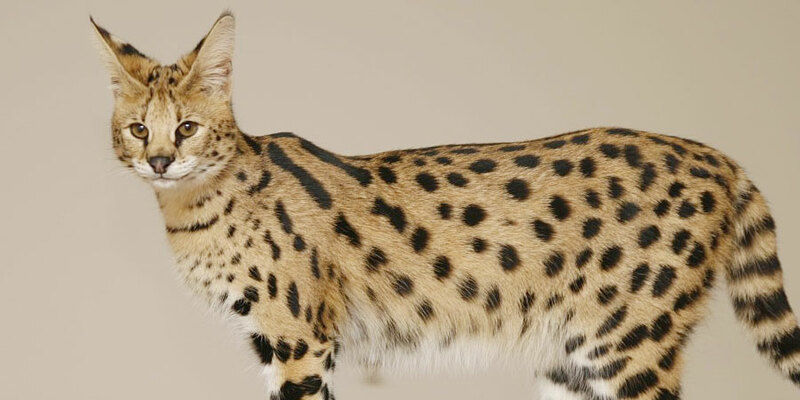 If you’re worried about handling servals proper, Savannah cats are almost certainly legal, and do not require special vets. Be warned: they eat a lot more than the average cat, are the record holders for the tallest domestic cat breed, and have a lot of energy. They make up for these drawbacks by having some of the most sociable personalities of any cat! A lot of the other entries on this list are cute and/or cuddly. Here’s one that’s not. Millipedes are not harmful like centipedes and are ideal for those interested in keeping arthropods. Their food is not hard to get – lettuce and other common produce suits them fine, especially with a dusting of calcium. 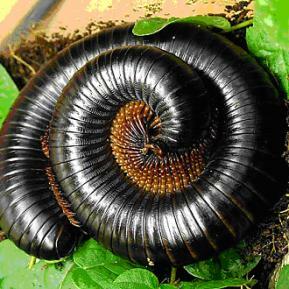 Giant millipedes are a common sight at many pet stores, and safer than any millipede found under a log. There’s just one, small thing: when threatened, millipedes secrete chemicals (including cyanide) that may or may not be toxic. Reactions in humans usually resemble an allergy. Although the most common pet millipedes are from the African giant millipede group (Archispirostreptus sp. ), there are a few other giant species that make identification hard. Wash your hands after handling a giant millipede, and you’ll be fine. 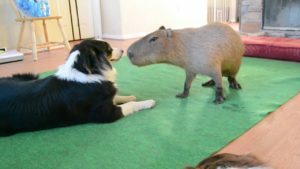 Sometimes called “giant hamsters,” capybaras (Hydrochoerus hydrochaeris) are the world’s largest rodents! The capybara is native to the Amazon rainforest and is completely herbivorous. They can also be kept in one’s yard…in theory. In practice, they need a pool, non-toxic grass, and a lot of patience and tolerance. On the plus side, you will never need your lawn mowed again. 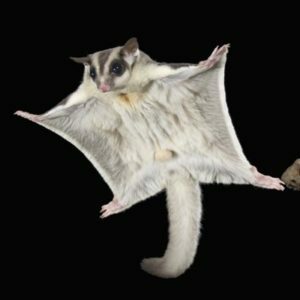 Although wallaroos and a few other marsupials are legal, sugar gliders (Petaurus breviceps) make the best pets out of of all of them. They are roughly comparable to flying squirrels, and are native to Indonesia, New Guinea, and Australia. These cuties are sap, insect, and nectar eaters in the wild, but commercial diets and supplements exist in case you don’t live in Oceana. They also happen to be nocturnal, so don’t worry if you don’t see a glider flying around during the day. Carrying a sleepy glider in a pocket or pouch while you go about your life is an excellent way to socialize them. Take a look at night to see their branch-to-branch acrobatics! People who like the cute, fuzzy, and unusual may have a new friend in an unlikely place. Skunks (Mephitis mephitis) are among the few wild North American mammals that can make good household pets. They are omnivores and were kept as mousers by the Amerindian tribes since before Columbus. Contrary to their signature stench, skunks are clean, cuddly, gentle animals. Even wild skunks don’t want to spray you – they have sensitive noses, too! Many of them do not mind being kept in a house any more than a cat or dog. Just be sure to get them de-scented, socialize any baby skunks well, and check your local laws. 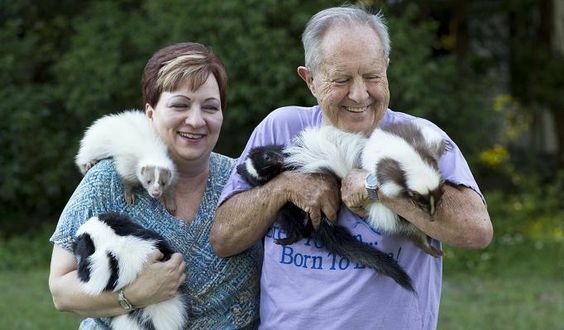 Skunks make some of the sweetest pets on the planet. Some readers probably ran the other direction upon seeing the word “python.” Horror stories abound regarding escaped pet pythons. Wilder rumors about pythons “sizing up” their human owners as food (this is bull – they don’t know when something is too big to eat) still come up whenever I mention the topic. Most of these tales involve the Burmese python (Python molurus bivittatus) – easily the most controversial snake in the past decade. Many people saw the docility and/or cuteness of a baby Burmese python and had suddenly had a 15’ (~5 meter) snake on their hands! 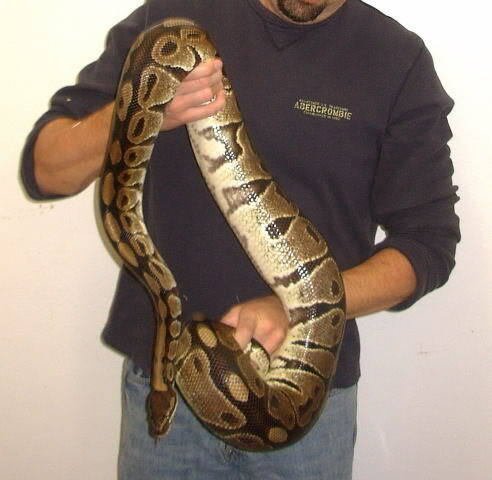 The Burmese’s smaller cousin, the ball/royal python (Python regius), is a whole other animal. These pythons cap out at 6 feet (~2 meters) tops, are defensive rather than aggressive and come in a variety of affordable colors. Ball pythons are ideal for first-time snake owners and people who are allergic to fur or feathers. Not all pythons are created equal. This is why we want you to research before buying a pet. This is probably a pet that almost nobody thinks about. 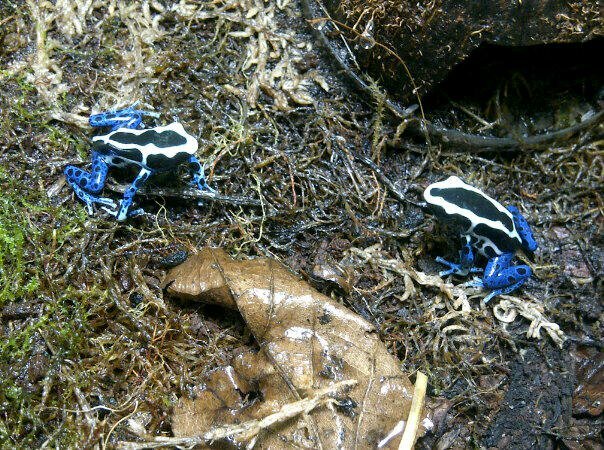 After all, who would want a poison dart frog (family Dendrobatidae) except an amphibian aficionado? Moreover, aren’t dart frogs the most poisonous animals alive? For the uninformed, the batrachotoxin in a dart frog’s skin is so lethal that a tiny dose of it could kill 10 full grown men in seconds. They get their name because this potent poison is used for tribal hunting darts in the Amazon. Anything hit by one of these darts dies. So, wait a minute, we can keep these guys as pets? How? Why? 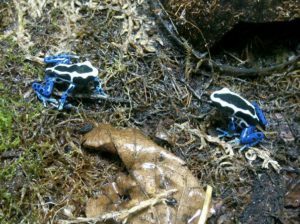 Captive-bred poison dart frogs do not become toxic at all. This is because their namesake poisons are acquired through bioaccumulation – that is, the bugs they eat are toxic, and by eating a lot of bugs, the frog becomes very toxic! Frogs you can get at an exotic pet store do not have the same diet as the frogs you would find in the wild, so they are safe to handle. They also require minimal space, very little cleaning, and look excellent in a fully-decorated terrarium. That said, even if they won’t kill you, dart frogs are “look, don’t touch” pets. The real pleasure in owning them comes from creating an entire setup.